A Brief History of Ironwork in Jersey. In Jersey we can date properties by the different styles of Ironwork that adorn them, ranging from early Georgian to contemporary styles of today. Hand forged ironwok predates the 1700s in Jersey, and is quite difficult to date as it is mainly utilitarian with no distinct style, just functionality. Judging by the number of dwellings in Jersey called La Forge one can imagine there would have been many blacksmiths working across the island a couple of hundred years ago. Most large farms and manor houses employed their own blacksmith; their ability to design, fabricate, modify, mend or improve objects is legendary. Right up until the industrial revolution when cast iron became affordable to the masses, most gates, railings, grilles, hinges and fire baskets were hand forged in iron. As cast iron embellishments were used, the frames were still made in wrought iron. When arc welding was introduced on an large scale after WWII, traditional methods of ironwork slowly disappeared as modern fabricating techniques became the norm and once again function overtook design. People's interest in heritage restoration, and more recently in recycling, means the traditional service that early blacksmiths provided can be transposed into the 21st century. Rylance Ltd. today is run on the same basis as it would have been 200 years ago. Showcasing a vital service to the island of Jersey. 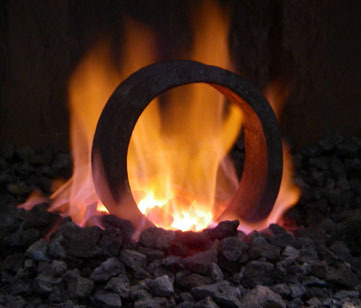 A wrought iron cannon segment in the forge.